The aniblogger sample for this survey was young and educated, and had varied backgrounds and religions. I understand that a group of anibloggers does not serve as an accurate sample of young America at large…but then again, perhaps it can in some facets. Drawing from my experience as a teacher, through online interactions over the past 15 years, and through other social interaction, I think I can say that the aniblogging population is similar to the thinking, leading, opinionated young people in America today. Of course, differences abound from region to region, neighborhood to neighborhood, and across cultural and other boundaries, but still, I think you can find people that are like this population in most every high school and college. These young people largely lack an organized religion that they are connected to. Many are, in fact, anti-religious (often a source of turmoil at home). And though it may be foolish to make predictions, I feel that in 20 years, you will be the norm in America. Those who cling faithfully to their faith will be abnormal, and perhaps those who even identify with a religion at all will be a minority. Anibloggers, then, I think are on the forefront of an entirely new generation that will be far more secular than those in past. America is going European. I’m the biggest hypocrite I know… But that’s fine, as long as I’m the only one who sees it. One set of responses that were no surprise had to do with how non-Christians viewed Christians and Christianity. It wasn’t good. Further statistics showed that many don’t really know a lot about Christianity, but they still had poor opinions of it. Perhaps a large part of that is because of how Christians act. If we acted more like Christ, who is largely considered admirable by anibloggers, then Christianity might admired more as well. According to the responses, Christians understand this. They view the Christian population in a similar way as non-Christians. And while certainty of one’s belief and the level at which are personal beliefs mix with interpretation of scripture differ, there are certain points on which it seems Christian anibloggers agree – the population needs to be less ignorant and more loving. While it may be much to say that Christian anibloggers can affect the culture at large, we can certainly change how others in our own culture feel about Christians and Christianity. Anyway, the fact of the matter is that, while the idea of religion is important and I think that one’s personal feelings about religion are immensely significant, not all find religion that vital. Some may find it at the very center of their lives, but for many anibloggers, religion is in the background or hardly present at all. I’m bringing two separate worlds together with this survey, and like church and state, they don’t necessarily go together. Shortly after distributing the survey, one highly-admired blogger took me task about it. We conversed some through email and I think came to an understanding. One point she mentioned is that religion and blogging are likely separate things for most anibloggers most of the time. The results support her assertion, as do the blogs themselves. 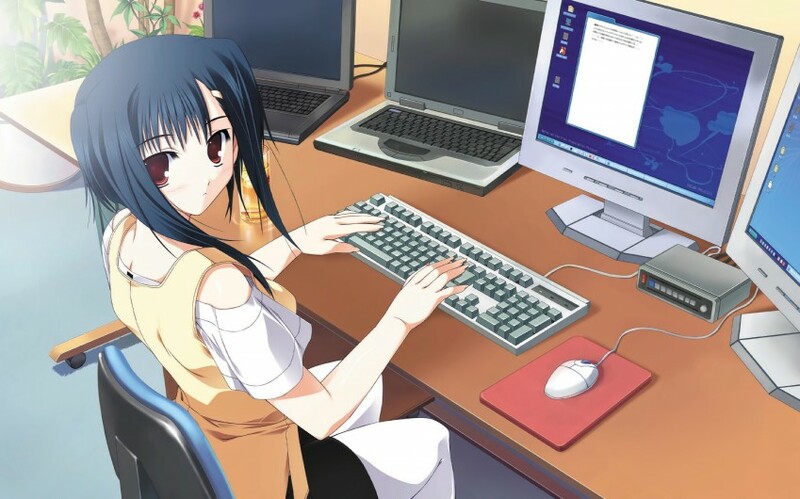 I scour blogs daily in search of posts about religion, but only a tiny percentage mention it, and even less make a connection between anime and one’s personal faith (most that do are Christian-related). But still, besides my own site and others in which the bloggers are outspoken Christians (Caught Up in the Rush, My Humble Blog Abode, Annalyn’s Thoughts, Breaking Metal Windows and Anime Bowl among them), excellent posts involving anime and one’s faith or involving their knowledge of faith come up here and there (hence my Spirituality in the Anime Blogosphere series). And though we as readers might not know it, the values we have that are instilled by faith may often find their way into posts in some form or fashion. So…while one’s faith tends to have little to do with what most anibloggers write about…it’s not entirely impertinent. Can’t We All Just Di-a-logue? On the day my survey went out, some tweeted about it, wondering what the point of it all was. Besides just being of personal interest to me, there was a greater (devious?) intent. I hoped that this survey would bring open dialogue within the aniblogging (and even greater anime) community. Judging from the comments, I think that my goal is starting to come to light. We obviously don’t understand each other’s faiths (or lack therof) very well. Protestants have misconceptions about Catholics’ faith; atheists think Protestants leave their minds at the door when stepping into church; Jews wonder why Christians have to make their faith part of every corridor of their lives; and agnostics wonder why Muslims can be so sure of their God. We don’t understand each other, and when it comes to something so intimate, so culturally intertwined, and so emotional a topic as religion, it’s really important to understand each other if we want to be open, loving, and compassionate. Of course, not all of us want that – but I certainly do. My blog is about anime and Christian spirituality. However, I want it to be a safe place where any can discuss religion without be browbeaten – whether you’re Protestant, Catholic, Wiccan, Muslim, or any other religion. If you’re an atheist or agnostic, I also want you to be able to express your views without thinking that I’m going to bible-thump you. And I hope that we can understand why we believe what we believe, in addition to clearing up misconceptions about each others’ faiths. I’m reminded of an exchange student from Indonesia that was in a history class I taught. She gave me a book about Islam and said something to the effect that I didn’t understand her religion. I was taken aback, having thought that I was being sensitive to all religions in my classroom – apparently, I wasn’t. That book helped me understand the idea of peace in Islam and that perhaps my experience with Muslims during my stays in Egypt and with what I’d seen on television had marred my idea of the religion. Do you see the application? Non-Christians, I hope that you’ll understand that our faith is not necessarily what is demonstrated by the religious right (though we may be part of it) or abortion clinic bombers (though we may be pro-life). Get to know us, get to know our faith through us, and get to know why we believe, and you may change our minds about Christians. That’s a wrap folks. Thanks to all who took the survey and for those who’ve read and commented on what I’ve written in the past week. I hope that these posts were enlightening, interesting, and helpful. And above all, I do hope that these surveys will help open dialogue, break down barriers and misconceptions, and bring a significant topic more to the forefront of our lives. Are there any other major conclusions y’all (<— betrays Texan upbringing) can draw? Very interesting series of posts! Since engaging in the online anime community, I’ve had more of a chance to learn about other views on religion. In the past month, especially, I’ve heard about twenty times as much from other views than all my life put together. Admitedly, my life hasn’t been that long, but still. It’s always a pleasure to hear from people who disagree with me, and to have a respectful discussion on all sides. I find this can be difficult on the internet since we can’t read eachothers’ body language. On the other hand, I can better collect my thoughts and think about what I’m saying when I write in in a forum or on a blog. It’s a great opportunity not only to learn about other perspectives, but also to be challenged in my own faith. I recently enjoyed a wonderful exchange with an atheist where we were both quoting Bible verses. It was interesting to hear how he saw these verses, and I mulled over them as I hadn’t before. We still disagreed several forum posts later, but I think we both profited from the discussion. I like the scenario you described where your student gave you a book on Islam. I hope that, if it’s appropriate for the situation, I have the courage to do something similar about Chirstianity someday. Thanks for the comment, Annalyn. Yeah, you’re definitely right about the difference in interaction online. It really can’t ever replace one-on-one interaction, but there are good things about being able to discuss religion in an online environment, a prime one being the ability to THINK before saying/writing. Great closing thoughts. It’s good to hear that you’re open to so many different beliefs despite being a devout Christian. It seems that you really practice what you preach which, sadly, many others don’t. One day I should write out what I consider my “religion” (if I want to call it that). Like I mentioned in my response to the survey, I drew a lot of inspiration from Mark Twain, as well as just general experience in life. Thanks, I try to “practice as I preach.” Of course, my words often don’t match my actions. I don’t know if I’ll ever do this survey again, though it’s definitely tempting, as I know of so many more anibloggers now and certainly will know more in the future, and would get also get a chance to make major improvements to the survey. One thing I am considering, and which was suggested to me, is to do more in-depth surveys with a select few. That would certainly lead to some interesting insights. I’ll definitely keep you in mind if I ever go down this route. The true God our father is now delivered. The Bible tells us how to find knowledge and how to understand it Isa 28:9-10 It is by precept on precept, line upon line, here a little and there a little. In the Old Testament there was not truth or grace John 1:17. The Bible is the book of the knowledge of good and evil Gen 3:22. The word of God must be rightly divided 2 Tim 2:15The bible says the Lord will create a new thing on the earth Jer 31:22 where a woman shall compass a man. This man is Satan Isa 14:16. A woman shall bruise Satan at the heel of time Gen 3:15. Satan has deceived the whole world Rev 12:9, until this bruise of the true word John 1:1 is delivered to the whole world Rev 12:5, 13 as a witness.The bruising of Satan is now taking place at http://minigoodtale.blogspot.com If you are one that loves the lord God with all your heart soul and mind and strive to live by every word of God you will want to read the true word. Haha, well…that’s, perhaps, something you need to reconcile one day? Hehe. We can always chat about that or anything else regarding your faith, if you want. Anyway congrats for having done this survey. I’ve also noticed that Christians who like anime tend to be more tolerant about interacting with people of other faiths. This is probably because the ultra-conservatives have rejected us numerous times by claiming anime is Satanic. Personal experience has taught me that understanding another person’s point of view and simply listening makes them far more willing to hear whatever you might say about Christianity. It sickens me to the core when I hear stories of cosplayers being harassed by megaphone preachers and one day I fully intend on composing a series of essays under the title “Anime Apologetics” with a forward that explains how the book shouldn’t be needed in the first place if Christians were truly practicing what they preach. By the way, I wonder if those preachers you’ve heard of are Westboro Church members? I think they were outside of that major con in NY a few months ago and were being shouted down by an even larger group of anime fans. Unfortunately, I think some think that Westboro is a truly Christian church, rather than being a cult. How on earth did I miss this? Ah, well. Definitely an interesting wrap-up. I think Annalyn had a good point in that anibloggers probably seperate faith from blogging. But I also think it’s really cool that you’re open to people from other religions posting and expressing opinions. I have to admit, I’m one of those people who seperates bogging from religion. Probably because I’m a religious skeptic- I’m skeptical of everything in my religion, and think everything over with a tablespoon of salt and a lot of research. I don’t think I’d feel comfortable talking about religion because I have contrary/liberal beliefs. And I think that if I really thought too hard, I’d find myself without a religion, or one that wasn’t Christianity – as much as I really, really do admire Jesus. So tying anime into religion just isn’t a comfortable subject for me. Yeah, it seems as if most anibloggers separate religion from blogging; it has little or no impact on what they write. In fact, some anibloggers have been emphatic in making that point to me. Thanks for sharing about your beliefs – I had no idea, and in fact, just assumed you were committed in your faith, even though I found that we often had very different opinions and such on CAA. I understand that you’re uncomfortable discussing religion – but certainly, if you ever wanna chat, you can shoot me a message. I think it’s natural to assume that people are solid/committed in their faiths unless they come out and say otherwise. I usually don’t like letting people know unless I’m somewhat anonymous (online), or really feel I can trust the person with it, since I’ve dealt with people who were scornful or otherwise not helpful when it came to talking about it. But to tie that into the post, I’m wondering if feelings that were similar to mine is why some of the bloggers seperate religion and anime blogging. Did you have something about that, that I perhaps missed? I understand where you’re coming from. I think in Christianity (and perhaps with other religions), there’s sometime a feeling that one needs to hide their struggles with faith or hide how their thoughts differ from what most of the church thinks. It’s unfortunate, because that atmosphere can really be hindering. I remember when I first returned to church, while I was in college, and someone assumed my parents were missionaries because they were in Egypt. I was like…hmmm…I think you assume I’m a super-Christian or something, when I was really questioning my faith at the time. Regarding separation of faith and blogging…about half of those surveyed were either atheists or agnostic in their beliefs, so it would be natural for them to separate. A graph I showed on one of the days displayed how “sure” each religious group was of their beliefs; Catholic bloggers, of which there are many, were often unsure. And while Protestants were mostly sure about their beliefs, many weren’t. I think that it makes sense that if you’re sure about your atheism/agnosticism or if you’re unsure of your faith, you might not involve it in your blogging about a different topic. And even if you were solid in your beliefs, it still might not find its way into your posts. PLUS, I think every country represented in the blog has separation of church and state at some level – so we’re raised separating religion from other matters. I’m sure there are also other considerations. Like Sweetpea, I take everything with a grain (or spoonful) of salt, though I’m pretty confident in the Bible. It’s everyone else (including religious scholars) whose words I sprinkle – or dowse – with salt. I don’t really understand why someone would be scornful about such a thing – seems like an irrational response, especially if someone wants to talk about faith. It doesn’t exactly give people a reason to be less skeptical, either. And, as in your case, scorn doesn’t exactly encourage talking. Then again, I’ve been irrational plenty of times, so I guess I’m in no position to talk. As someone who considers herself a firm (if imperfect) Christian, I still wonder sometimes whether to write about certain aspects of my faith. I couldn’t ever cut Christianity entirely from my blog, but I did consider separating deeper posts about Christianity from posts about anime or other topics. For one thing, I’ve been writing with an audience of anime fans in mind for the past few months, and not for people of a specific faith or stage in their walk of faith. In face-to-face encounters, I speak differently about God with fellow Christians than with atheists. Similarly, I’ll tone down the “church speak” with a new Christian where I might go all out theological debate with a Christian of multiple years. I don’t change the truth of what I speak – just the way I approach the topic, if it’s appropriate to approach the topic at all. On my blog, I have little idea who reads it, so I wondered briefly if I should write about anime and faith (at least any deeper posts) on separate blogs. I finally just threw up my hands and said, “This is me. One day I might write about Naruto, the next about Jesus, and the next about both of them together. I’ll just make sure I don’t assume all my readers are Christians, just as I don’t assume they all understand various anime terms. Beyond that, I’ll write whatever I want.” I don’t feel forced to say “Jesus” at least once every post, but I don’t feel obliged to leave Him out, either. Once I reached that point, it was rather freeing. And, knowing that many of my readers may not be Christians, it’s easier to remember to keep my tongue (err… fingers) in check and be graceful about what I say. So for me, any hesitancy about writing about religion has always been how the audience may respond. I’ve come to the conclusion that such hesitancy is unnecessary and won’t feel natural unless I’m writing a blog about math. It’s much easier for me to just be honest and include or not include my faith in a post as feels natural on a case-by-case basis. Thanks for the essay, hehe. As always – very informative. I do have a partial solution for your problem. Write for my blog. Anime + Christianity here, and just anime on yours.